Perfect for international business and sports events, Olympics, World Cup, etc. Create a carnival atmosphere with this flags of the world bunting! 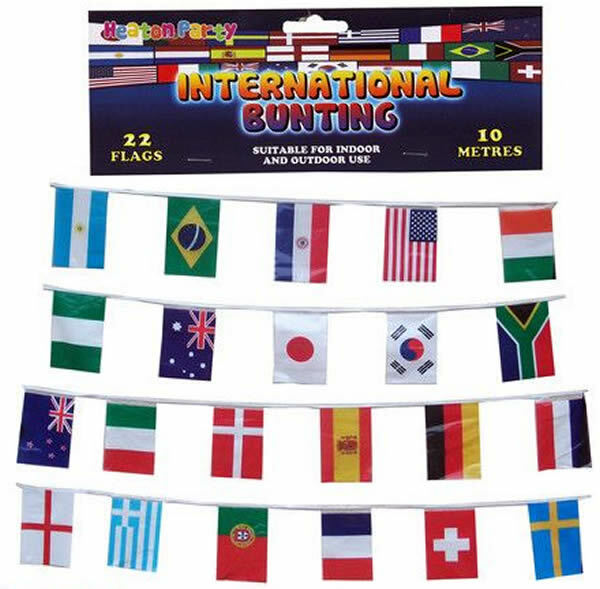 Each 10m (33ft) length of this flags of the world bunting has 22 lightweight PVC plastic flags that are suitable for indoor of outdoor use. Each flag measures 21cm x 29cm. 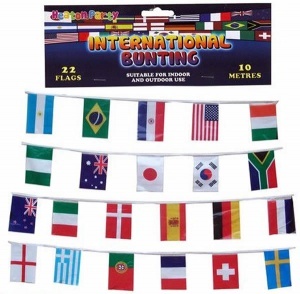 This international bunting features flags from the following 22 countries:- Holland, England, Germany, Spain, Denmark, Italy, Switzerland, Portugal, France, Greece, Brazil, Paraguay, Argentina, Sweden, USA, South Africa, Ivory Coast, Nigeria, Australia, Japan, South Korea and New Zealand.